I’ve lost the stained photocopy of my fool-proof marmalade recipe. And I’d just bought a bag of organic, discounted end-of-the-line Seville Oranges, and some Blood Oranges, which to me are sweet-bitter-tart red-juice heaven. So I needed to proceed without that perfect recipe– perfect in proportion, and in technique, and see what I can remember…. the best thing is to save the pips/seeds and soak them in water for as long as possible, for a natural pectin. from experience, many recipes call for too much water, which you end up wasting time and energy boiling off. Orange (Seville and Blood) and Beetroot Marmalade; Orange and Parsnip Marmalade; Orange and Carrot Marmalade, Orange and Beetroot and Parsnip and Carrot Marmalade. 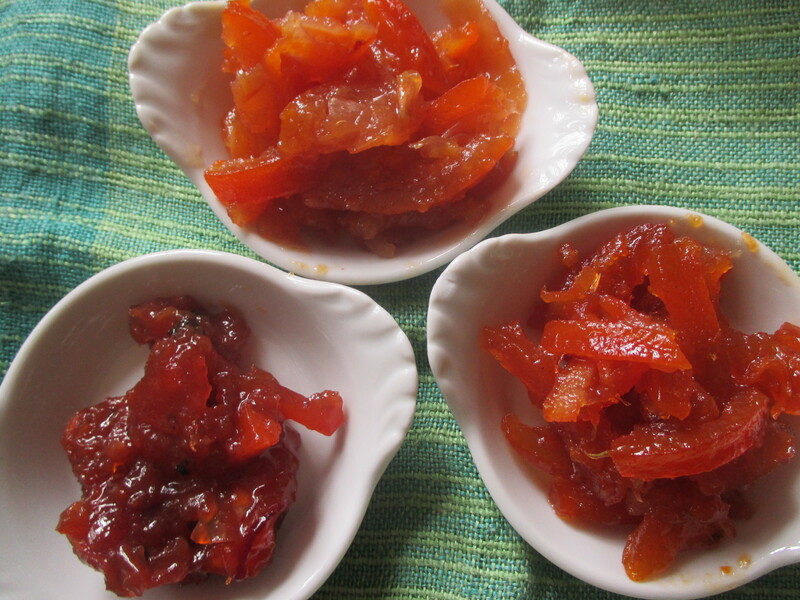 The idea is to augment this essentially exotic (though traditional) preserve with a little bit of a local/seasonal ethos– and feel good about the vegetable content. When I make jams, I’ve always been successful with the Joy of Cooking proportions done in volume measurements (the American way, vs. weight). The recipe for jam from berries says 4 cups fruit to 3 cups sugar. Wary of white sugar, I always try to reduce amounts, aware nonetheless that jam is after all a fruit and sugar preserve, and needs the sugar to gel and not go mouldy. So with my Blackberry Jam, for instance, I’ll usually go for a very generous 4 cups to a very very scant 3 cups, and sometimes reduce further. This will still taste super sweet to me. 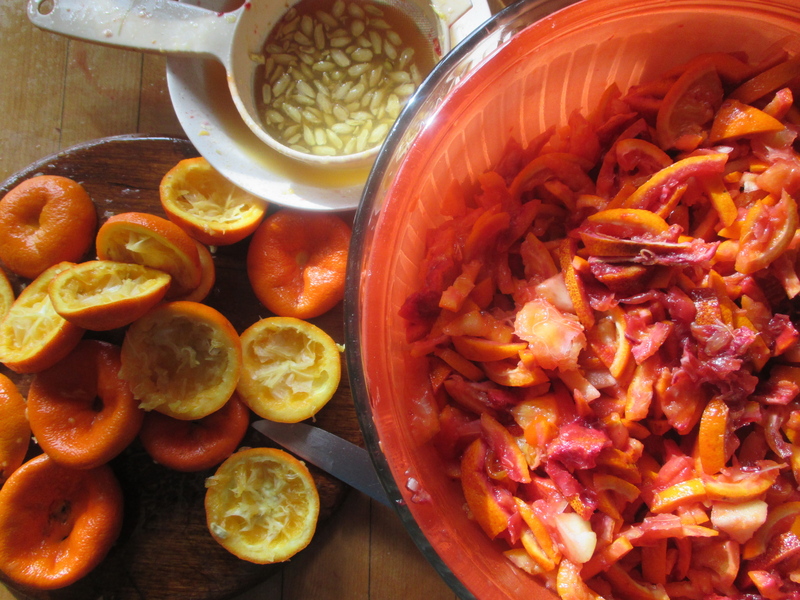 I halved the oranges, as in the picture above, and squeezed the pips /seeds out into a sieve, retaining the juice. The skins I cut into fine shreds. The pips/ seeds soaked overnight in water, and indeed that water became gelatinous in texture, almost like flax seeds when soaked– so one can see why they are a great thickener. I strained out the seeds and added the “pectin-water.” And a little more water felt right. And then I divided that lot of orange shreds, and to each lot added a cup or two of grated veg, measuring then the full bulk and adding sugar in the 4 to 3 ratio above. The photos don’t show the colours subtly enough– the really red one is the beetroot, the lightest one, the parsnip, and the medium dark one, the carrot. They all taste very subtly different. I am crazy for the bitter back taste of marmalade. I reckon these preserves would be wonderful to make little Christmas tartlets with as well, with walnuts I’m imagining. On the theme of vegetable jams, here are some nice recipes from the ever interesting kitchens of Hugh Fearnley-Whittingstall. 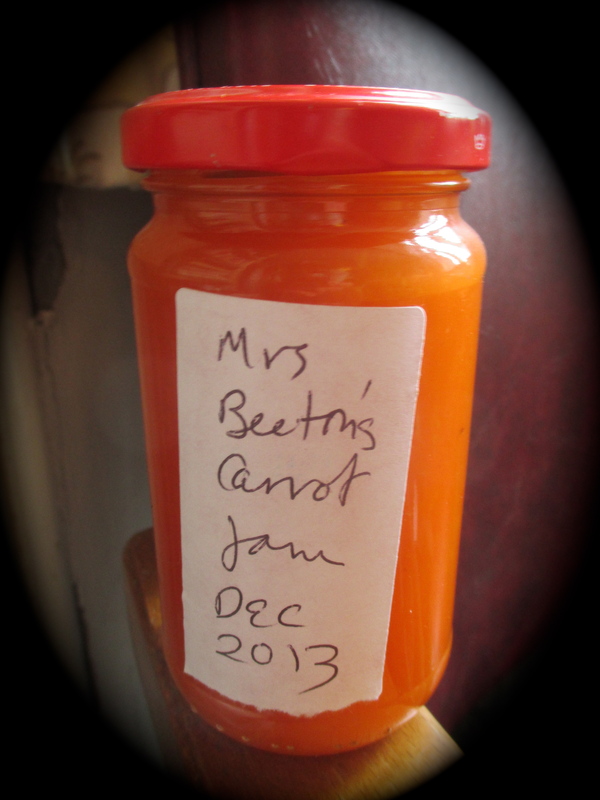 In December I made a lovely carrot jam, remembering Jane Grigson remembering Mrs. Beeton (recipe can be found on this site) — Jane Grigson in the wonderful book Good Things sticks in an almond I think, and talks about carrots being a war-time subsitute for apricots. The colour is gorgeous. I decided to up the almond idea by adding almond extract, and would do this again. 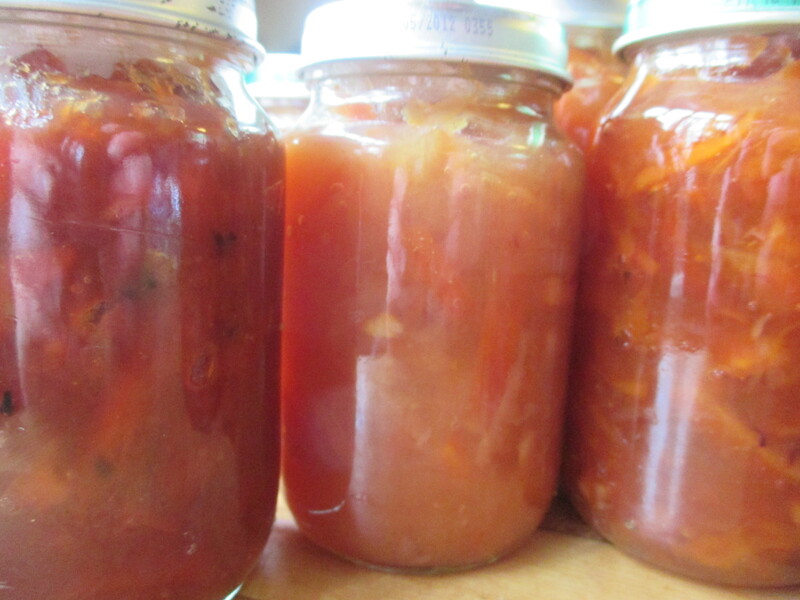 I look forward to making jam tarts with this carrot jam. *Postscript, 16 May 2014. I’ve been reading about Beet Jam, and came across this explanation why alkaline vegetables are not really shelf stable. No one I’d encountered before was worried, but I feel dutibound, as a worrywort myself, to mention that Eugenia, below, recommends these as refrigerator jams vs. long term preserves. Lovely recipe Annie. I have a technique with jam making using parfait jars which means you can dramatically reduce the sugar. Maybe it would work for this recipe as well? I’ll give it a go when time allows. Thank you– I would love to know more. Going to look up parfait jars this very minute, not sure what they are. Loved the beetroot marm Annie, the colours have brightened my day! Looking forward to Christmas in your kitchen already! Wow…this is new to me. What is preserving it, do you know? With normal jam technique its the sugar & you create a seal with the cellophane and rubber band.With parfait jars you create a better seal with the rubber seal and heating so a vacuum is created which means you can reduce the sugar a lot.